Is There Life Beneath the Tiger Stripes of Enceladus? While most people recognize Saturn from its nine immense rings, you’ve probably never heard of Enceladus, one of its lesser moons that hasn’t received nearly as much attention in the media lately as Titan. While researchers have proposed that life may exist on Titan, even non-carbon based life forms much different from any life as we know it on Earth, Enceladus is another likely candidate for maintaining lifeforms. It might even be a bit more inviting than Titan, where any submersible probes would have to be built to endure extreme cold. Although Enceladus contains an immense sea encrusted with ice, two recent studies have suggested that hydrothermal vents exist beneath it, allowing heat to enter and maintain life forms similar to those found on Earth. It’s an idea similar to what planetary scientists think may be happening on Jupiter’s nearby moon, Europa. As interest in the search for extraterrestrial lifeforms has increased, and perhaps Enceladus may be among the first places to look. Hydrothermal vents are like the geysers of the ocean, present along mid ocean ridges, forming when underwater mountains like the Mid Atlantic Ridge shift in position. Ancient hydrothermal vents exist on Mars, where an ocean that was once larger than the Arctic Sea has been discovered. However, planetary scientists have yet to see any hydrothermal vents on Enceladus at work, much less any direct evidence of marine life. 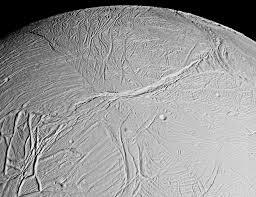 Enceladus’ warm water is concealed underneath an icy crust that’s 25 miles deep. However, the researchers believe that volcanic activity would be the best way to explain materials captured on the moon’s surface by the Cassini spacecraft. Scientists also learned that the icy spray was partially responsible for Saturn’s faint E-ring. Using a Cosmic Dust Analyzer they looked closely at the contents of the spray. Along with naturally formed ice crystals, they discovered particles rich in silicon, about one nanometer in size – bits of dust made of silica, the same compound known for plugging up volcanoes on Earth. Along with the methane, this is a prominent sign of volcanic activity from hydrothermal vents. It is also likely that these mechanisms could support underwater life, just as silica and methane do in deep-sea settings on Earth. “What we did first was just to know what these particles were, and by doing this, we started to think about how they formed,” said Hsiang-Wen Hsu, a researcher at the University of Colorado’s Laboratory for Atmospheric and Space Physics. In order to replicate similar particles, the scientists learned the only way to make them from ordinary rocks was to have minerals interacting with alkaline water under temperature that were at least 194 degrees Fahrenheit. The water also had to contain salinity levels just under four percent. All of these conditions can be found in the hydrothermal vents beneath the Atlantic Ocean, a region called the Lost City, in which volcanically heated water permits the existence of some strange marine life, capable of thriving without sunlight. “That is a very good analog to what we have,” Hsu said. The study, which was led by Hsu, was published in the journal Nature this week. An additional study has just been accepted for publication in Geophysical Research Letters, and gives further evidence to the hydrothermal hypothesis. Alexis Bouquet of the Southwest Research Institute conducted the second study – giving an analysis of Enceladus’ water plumes. Gases in the plumes are consistent with Earth’s subglacial lakes, with higher levels of methane in the plumes than what was predicted. Spilker, who works for NASA’s Jet Propulsion Laboratory, said that the methane study is a “nice, complementary part of the story.” While researchers had known of water rising out of the cracks in Enceladus’ ice, they weren’t sure if it was warm enough to sustain life. “What’s really striking is that this is the first time we’ve seen active hydrothermal vents outside of the seafloor on Earth,” Spilker said. This vent activity may be stimulated by a tidal pull from Saturn and its other moons, particularly Dione. So far, Enceladus has been known to contain the “Big Three” criterion for life on Earth: the presence of liquid water, chemical building blocks essential to organic activity, and even energy sustenance in the form of hydrothermal heat. So is there life on Enceladus? “That is the big question left to be answered,” said Hsu. It is still possible to explain the observations made by Cassini through other means. “It is necessary to have a more systematic study to understand why this way works and the others do not,” Hsu said. Even if Enceladus does contain these hydrothermal vents, they may not be active long enough to allow life to evolve. “For life, the conditions have to be stable for a long time. It’s most likely that the activity on Enceladus is episodic,” Hsu said. Cassini will sample the moon’s water plumes again in October when it makes a close flyby — but it was not equipped to detect life. It will be some time before another expedition is made to Enceladus, as researchers are currently at work on an expedition to Europa, whose ocean is thought to be much larger than the one on Enceladus.